Mark Wilson leads the youth travel baseball organization Hank’s Yanks. In addition to training young baseball players in the art of baseball, Hank’s Yanks is committed to instilling a strong community service ethic within each of their players. Mark found out about the League of YES, formerly the Miracle League of Long Island and brought some of his players to the field to be BUDDYs and see how they could help. That one visit soon turned into more and Hank’s Yanks quickly became favorites among many of the league players and families. After volunteering to be BUDDYs for League of YES players a number of times, Mark felt Hank’s Yanks could not only do more, but do something special with the League of YES. In 2014, Mark brought the idea of a skills based baseball team for the older and more able players of the league to Executive Director Kristine Fitzpatrick. Mark and the trainer for Hank’s Yanks, Matt Guilaino got together with Kristine and developed what is now the Skills Program and have combined it with their BOP Baseball Outreach Program. After two years, the Skills Program is training thirty League of YES players in proper baseball skills as well as instilling a wonderful community service ethic within all Hank’s Yanks players. 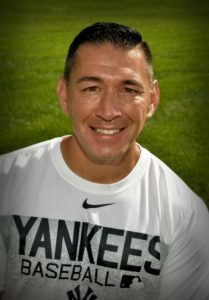 Not only is Mark a great Coach for the Skills Team, he is the General Manager of Hank’s Yanks as well as holding the position of Associate Scout for the New York Yankees. Not enough for you? Mark is also a veteran of Desert Storm and a well respected member of the New York City Police Department. Don’t let those youthful looks fool you, Mark has seen a lot yet he strives to give back to all of us through baseball.